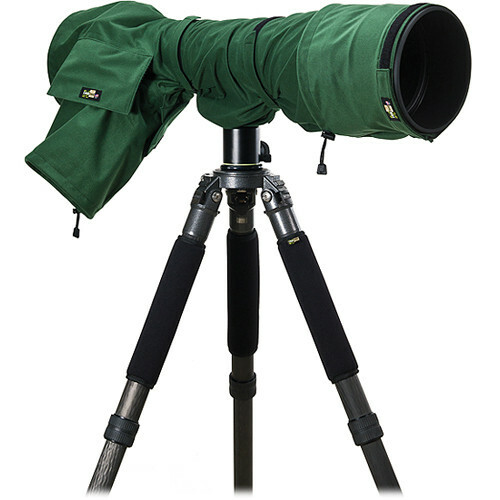 Protect your gear from the elements with the RainCoat Pro (Green) from LensCoat. This product is designed with the outside shooter in mind, offering excellent protection against rain, wind, sand, snow, and dust for your gear. It is designed to fit lenses with focal lenghts from 300mm to 800mm. Made from a lightweight poly tricot material, this coat fits tightly around your lens through the use of cinch straps. The fold-out arm sleeve has its own dedicated storage pocket and provides access to your camera's controls. A rear opening also provides more full access to your gear, while a hook-and-loop closure at the bottom enables you to use the lens' focus ring. This version comes in a solid green color. Other features of this product include a mesh storage pocket and an extension sleeve that allows for the use of hoods in 600-800mm lenses. Optional accessories are available separately, such as LensCoat lens covers, Hoodie lens caps and camera BodyGuards. This product is made in the USA. Box Dimensions (LxWxH) 9.4 x 8.3 x 2.4"
RainCoat Pro (Green) is rated 4.7 out of 5 by 55. Rated 5 out of 5 by Frank from Very Good Product I am a proponent of Think Tank products and I have the Think Tank Photo Hydrophobia Rain Cover but it is un-user friendly to place on the lens and camera plus the plastic window gets fogged up and it becomes grungy over time....so I wanted something easier and quicker to put on and also where I had more control of the camera. I found the LensCoat products and read the reviews and they are all spot on. I had the raincoat on my 1DX and 400 2.8 in less than 60 seconds. Plus the entire back is open and the camera LCD and controls are in full view and more accessible for me. I normally wear a photo vest when shooting sports and when there is a forecast of rain....it stores very nice and flat in the rear pocket....where the TT is rather bulky. Rated 5 out of 5 by pndldy from Its raining, oh no! This raincoat comes in two sizes, the pro is for the bigger lenses, say 500 and above. I bought the Digital Camo print. It goes on quickly and very easy. The cinch straps allows you to adjust the length of the cover and will keep it snug around my lens. It has a fold out arm sleeve from its integrated pocket for access to the camera controls. You can also access the camera through the rear opening and the lens through the hook & loop bottom closure. You will not need a dedicated eyepiece for the cover. It is a waterproof, breathable poly tricot material and not a bit noisy. The kit I bought has a Hood extension sleeve included for my 500 lens with teleconverter. Rated 2 out of 5 by Michel from I do not like this Unfortunately, what I got was much too large for a Sigma 120-300 lens 2.8 Ex Dg bones, that I should adjust by a seamstress, return procedures would have me definitely cost more expensive than repair costs, the manufacturer's recommendations are wrong, because my Sigma lens is the same size as the 300 or 2.8 Nikkor Canon and I trust the above to purchase .... should rather indicate the dimensions minimum and maximum of Raincoat including the camera. instead of Pro..le Raincoat Raincoat wide would just .. Seriously I am very disappointed. Rated 5 out of 5 by Goldeneye from This is what I've been looking for! I really love my new RainCoat Pro. The quality is first rate. I have other more expensive rain covers that I never use because they are so cumbersome but the RainCoat is very easy to install and use. Having an open back means I don't have to use a dedicated eyepiece that I'm always losing and easy access to the camera controls. I use it with my 300 2.8 and 600 f4 and the cinch straps nicely hold the material close to the lens so its never loose and flopping around. I also like how quiet the material is. Highly recommended. Rated 4 out of 5 by colin knight from Good solution for keeping dry gear Does the job and seems to be very durable fabric. However, I wish that the back would cinch tighter, or use some other method of closing. I typically throw my 500mm over my shoulder, front element facing the ground. The small opening in the back now pointed up, even with the drawstrings cinched tightly, can allow water to seep in to the camera body if you're not careful. Rated 5 out of 5 by James Doyle from Must have product for inclement weather Inclement weather can yield amazing images if you get out but you have to be prepared or you may come home with damaged equipment. Rain covers for your camera and lenses come in a variety of different styles and brands, ranging in costs from about $50 and up to several hundred dollars. Or of course if you are handy with a sewing machine you could make your own. Over the many years I have been a nature photographer I have tried nearly all the commercial versions available and each has benefits and drawbacks in the way you attach it to your gear or how weather resistant it really was in the field. Of all the commercial versions on offer, I recently started using the LensCoat RainCoat Pro purchased from B&H which I found to nearly fill all my requirements when shooting with longer lenses (from 300mm f2.8 and up). The cover is soft to the touch and doesn't rustle in the wind, has clinch tabs for tightening any loose material, is waterproof with taped seams. The raincoat covers the complete lens and body easily. If I was to nitpick, my only other observation is that it doesn't easily allow for an off camera flash cord attachment; which would be a common situation with tripod and flash with better beamer. Rated 4 out of 5 by Marcel Huijser from good protection, good camera access I use it to photograph outdoors in snow and light rain. This rain cover provides good cover while allowing good access to back of camera and the side through the sleeve. Also, the cover allows the lens to be mounted on a tripod. I like the material as it makes little noise and it is not shiny (wildlife photography). These things are very important as shiny material wwould get even more shiny when wet. Rated 4 out of 5 by Mtn Monster from good investment for protecting your gear The raincoat pro is worth the investment to protect your cameras & lenses. I use this for my Nikon D750 & Tamron 150-600 mm lens.Spending $ is piece of mind.It takes a little time to get used to installing it correctly. I would recommend practicing several times so it becomes second nature. Better to learn at home so you can use it when the weather turns bad.I chose the Realtree Max camo pattern to help break up my camera's silhouette for wildlife photography.